Fuses, terminal blocks or relays – without DIN-rails many electrical components would not be securely fixed within a control cabinet. 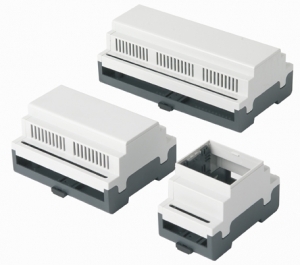 Combined with DIN-rail enclosures, the sensitive parts are optimally protected. The design possibilities for DIN-rail enclosures are just as numerous as their application areas. The apra-group provides both standard enclosures as well as those tailored to the customer's needs. An innovative production concept ensures that 'individual manufacture”' does not automatically mean expensive. The die shop is one of the most important areas in the manufacturing industry. After all, it is interface between product development and serial production. Within the process chain, the die tool manufacture is also a significant cost factor. Depending on the industrial sector, tools account for up to 30 per cent of the entire production costs. Tool costs also play a considerable role in the manufacture of classic top hat rail enclosures. However, in the case of the apra-Rail DB enclosure series, apra – a medium-sized company specialising in enclosures – is breaking new ground. On the one hand, the enclosure is available in several standard versions, which cover the majority of customer requirements – for example, closed, ventilated or open for connector blocks. The standard types are immediately available from stock and consist of a top and bottom shell, DIN-rail clips and circuit board holders. Mr Ostermann explains: “The savings generated through our flexible tool concept lie at up to a third of the costs for a complete tool. In the case of smaller to medium volumes, the apra-Rail DB standard enclosure is machined until it meets customer requirements. There are also projects in which only the apra bottom shell including the top hat rail clips is taken as a basis, and the customer together with apra develops a complete, customised top shell. For more information, visit www.apra.de.